One of the best feelings in the world is being able to share your passion with other people. It’s even more special when you can share that passion with your family, which is part of the magic behind Fuzzrocious Pedals. The New Jersey-based effects company is run by the Ratajski (pronounced “ruh-tie-skee”) family. The husband and wife team of Ryan and Shannon create the circuits and paint the enclosures, respectively, while their young children Kaeden and Raeven get in on the fun with special “kidpainted” designs. A bass player himself, Ryan designs his pedals to work equally well on low-end instruments as well as guitar and just about any other application. 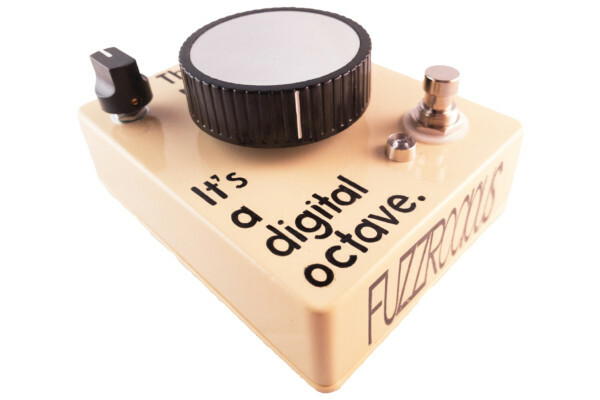 The Fuzzrocious line ranges from reimagining classic circuits to innovative combinations of effects to seriously deep tone-shaping options. Shannon’s art is equally ambitious with cool tattoo-inspired designs and some really wild custom enclosures. We caught up with Ryan Ratajski to get the scoop on his start, his designs, and working as a family. How did you get into building pedals? I was playing in a band with friends and noticed the guitarists’ massive pedalboards filled with bare boxes and other boutique effects. My bandmate and longtime friend, Lukas McCutcheon encouraged me to get a kit from General Guitar Gadgets and build a big muff. My father came over and taught me to solder. I was immediately fascinated and addicted to making kits, so I contacted every friend who was still touring in bands to let me make pedals for them with my wife, Shannon’s handpainted designs. From kits, we moved to veroboard and PCB clone improvements. Within two years, we were creating more original effects from circuit building block ideas to where we are now creating original effects. I want to make things that have a purpose and sound rad. If I wouldn’t use the effect in some way, I wouldn’t want to make it. It’s frustrating yet freeing to start an idea in the bathtub, bring it to the breadboard, fab it on veroboard, tweak the design, and bring it to life on PCB and share it with the world. I strive to make products that I think people need in the effects world. Even if they don’t catch on right away, I am confident that they will find their way and people will come around to using them. In terms of Shannon’s art, we are fans of traditional/neo-traditional tattoos, so much of her work reflects that. She loves animals and creepy things, so that works its way into our art. 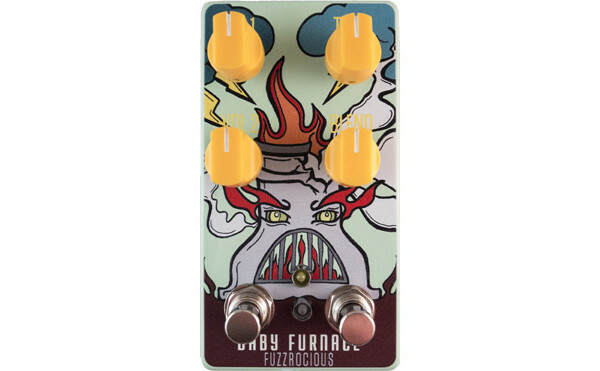 How does the family dynamic play into Fuzzrocious? Having the family involved separates us from the rest of the gear world. It’s humbling that customers want to take a gamble and let our children making something that is truly unique for them. We don’t limit them with art ideas or color choices…we let them go and the customer reaps the benefits. There is a major shortage of women in the gear world at the front of companies, so being able to work with my wife as the other stakeholder in the company is not only rare but easy. We don’t really fight or bicker as it is, so having someone to bounce ideas off of the make company decisions (and balance out my neuroses) puts us on a different playing field than many other companies. The downside to this is that the income from the company is a direct reflection of our family and the vibe/products we put out and when we have slow months, it’s REALLY scary. It does feel personal at times when old customers, potential customers, and musician friends don’t support our releases, but it’s also great that our four brains can come together with ideas to make new, exciting effects with unique, striking art that will attract customers of all walks of life. It’s important to turn negative thoughts into fuel to make better products. How does your own playing experience affect the way you make your products? I start as a bassist when making effects and work towards equalling the playing field towards the guitar. I want an effect that will work on bass, bass vi, baritone, AND guitar, not one or two of those instruments. I typically write and play heavy, spacey, moody music, so most of what I tend to create lends itself to that field. I am keeping in mind that not everyone plays how or what I play, so it’s important me to pull in more versatile players for our demos to show a wide range of sounds one can pull from our products. What is the most important feature of an effects pedal to you? Equal parts looking good to sounding good. If it sounds good and but looks uninspired, it’s a letdown. Tell us about your process in creating a pedal. Most ideas start in the bathtub. It’s one of the rare, quiet moments I get, especially in the summer while the kids are home more often, that I have to lay my body in the water, sink my head, and close my eyes. In quiet moments, my brain “moves.” Occasionally, an idea hits me at a concert/show or while I am meditating. From the idea, it goes to paper to write out the idea, then to the breadboard. From the breadboard, once it feels decent enough, I veroboard it and put it through its paces. Veroboard lends itself easily to mods, so swapping parts out is usually pretty simple. After that point, once all is said and done, it’s off to PCB design and production. What is your favorite part about building? Every step of the process has its ups and downs. Firing up the first PCB and having it work is the most gratifying part of the game, followed by the first orders that come in for the pedal. How do you more recent pedals compare with the first? Well, the first pedals we made were kits. What we make now are original designs or mostly original stuff, so it’s light years ahead of being a glorified kit maker. Even compared to clone improvements, new sounds, new builds, and new designs dwarf old work. The designs look better, sound better, and have more heart in them. The hard part about the gear industry is that people have a hard time trying and accepting new designs. I’d love for the gear world to be open to new things, but I guess it really comes down to human nature, right? What’s the craziest thing you’ve been asked to incorporate in one of your products? It’s mostly art ideas that are crazy. I won’t put anyone on blast though! The most general crazy idea that we get is the have a single footswitch that changes to different functions. In an analog world, you just can’t make a footswitch that changes from momentary to latching, then activates a boost, and then dimes all of the pots. Dreams are cool. What would you tell someone thinking of getting into electronics? Don’t electrocute yourself, breathe in solder fumes, or burn yourself.